(Honolulu, HI – March 2016) The High Technology Development Corporation’s (HTDC) Hawaii Center for Advanced Transportation Technologies (HCATT) is sponsoring a demonstration of a $6.8 million renewable and clean, waste to energy generating system at Joint Base Pearl Harbor-Hickam (JBPHH), on the campus of the Hawaii Air National Guard (HIANG). The demonstration will continue through this summer, and was facilitated through a contract with Biomass Energy Systems, Inc. (BESI). The waste-to-energy (WTE) project demonstration showcases the efficacy of converting 10 tons of waste per day to electricity using a state-of-the art gasification technology. The Air Force Research Labs (AFRL) selected the Hawaii Air National Guard’s 154th Wing to demonstrate an integrated micro-grid concept that tests the viability of using renewable energy and micro-grids to assure that the US Air Force (USAF) can continue mission critical operations regardless of the state of the public utility grid or cyber-attack. Phase I of the micro-grid will utilize a rotary kiln gasifier that turns waste into fuel, heat and electricity. JBPHH was selected based on Hawaii’s variety of renewable energy sources, the high cost of electricity, and complexity of the Hawaii Air Guard’s 154th Wing, which operates the F-22, the most advanced fighter in the U.S. inventory. The waste to energy project represents an investment by the USAF to determine the feasibility of solving the challenge of waste disposal with the opportunity to offset the cost of electricity on base. The system at JBPH-H was built by BESI. 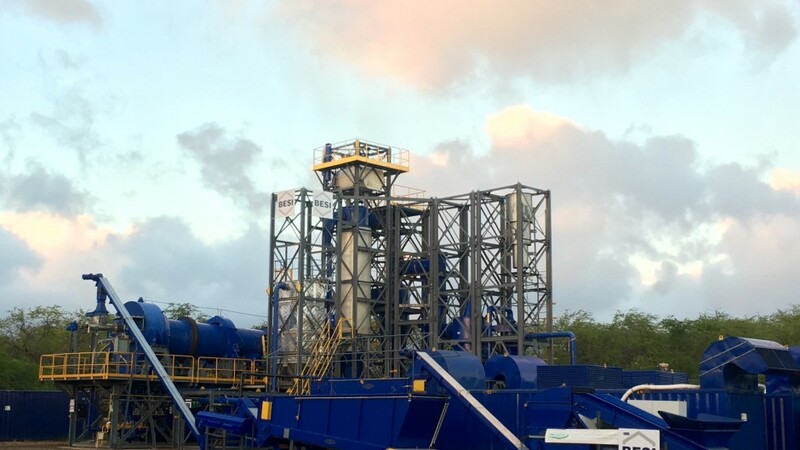 It is designed to handle between two and 10 tons of waste per day and generate a net 200 to 300 kW of baseload power using four generators run from the syngas produced by the gasifier. The BESI rotary kiln system TurnW2E® was installed at JBPHH in December 2015, and has completed all of its initial testing this month. It will begin running specific “recipes” for several weeks to collect data using specific “feed-stock” that can be expected from a military base with a population of about 2000 people. Upon test completion, the system will be evaluated on its ability to produce hydrogen for use in fuel cell vehicles currently being demonstrated at JBPHH. A subsequent system test will be conducted to produce a liquid jet fuel from waste. Eventually, the USAF plans to include the gasifier in the first phase of its micro-grid project at the end of this year.